Java Sweets is Springing Forward! Who doesn’t love spring? As days become longer and the air becomes warmer, once again we are reminded of the beauty of God’s creation. After a cold winter’s nap, the trees are greening up and spring flowers are blooming all around. It is truly a lovely time of year! As Easter approaches, families are planning to celebrate with brunches and dinners. But as the weather warms we become a little more conscious of diet or at least I do. However, no one likes to give up sweets totally so why not portion control? Java Sweets has made this simple for you with our individually packaged gourmet coffee cookies! The cookies stand great alone or they can become part of another recipe. Our picture features our Java Sugar Cookies as the crust for a fruit tart. Just spread your favorite flavor icing on the sugar cookies and top with your favorite fruit! It is an extremely easy, elegant dessert. You could also use any of our cookies to layer in banana pudding. The real coffee flavor in our gourmet cookies pairs well with just about anything! 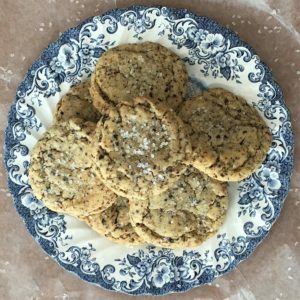 We hope you get to try these delicious cookies as a tart base, in banana pudding, or in your favorite desert! And please share your ideas with us on how you incorporate these cookies into whatever sweet treat you choose. We are always experimenting with new flavors here at Java Sweets so if you have a new flavor idea for our cookies, please let us know! Thank you to all our Java Sweets customers!